Hockey Blog In Canada: Almost The Best Birthday Ever? Last night's SPHL game in Southaven, Mississippi was all about a fairly famous person born in Mississippi. The Mississippi RiverKings hosted the Lousiana IceGators on this night, and they celebrated what would have been Elvis Presley's 78th birthday on January 8, 2013 with what minor-pro teams do best: a themed jersey! 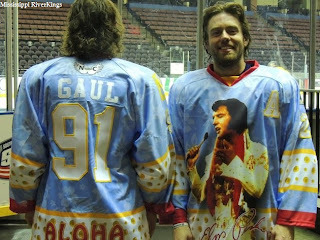 I'll admit that seeing the Elvis-themed jerseys at first was a little off-putting in that they seem very kitschy with their overly-Hawaiian accoutrements. However, having the RiverKings celebrate one of music's most famous people seems appropriate considering that he was born in Tupelo, Mississippi - a mere 90 minute drive from Southaven on I-78! While the RiverKings, on paper, looked a little kitschy, it remained to be seen what they looked like on the ice. After all, theory is one thing, but practical use tells an entirely different story. So what did the uniforms look like on the players? Alright, let's run down the good and the bad, shall we? The image on the front, and the Hawaiian imagery on the uniform, is due to the fact that January 14 is the 40th anniversary of the Aloha from Hawaii concert that Elvis Presley headlined just six days after he celebrated his 38th birthday. This event was a huge undertaking as it was the most expensive entertainment special at the time, costing a whopping $2.5 million, and estimates figure that the concert itself was seen in 40 countries and by as many as a billion people. So, yeah, it was a pretty big event. We know where the image of Elvis comes from in terms of this weirdly-designed uniform and the reasons for the Hawaiian imagery. The only problem is relevance. I'm not sure that the majority of the key demographic of males aged 18-50 would remember this concert or were even born. The image of Elvis is fine, but the Hawaiian-themed background makes this uniform nothing more than a hot mess with the white block font. Sure, Elvis stands out against the light blue, but the names and numbers do not. I'm not going to crucify the RiverKings for this detail, but I'd like to be able to clearly see who has the puck. Overall, being that this is a specialty jersey, the RiverKings did auction them off to help raise money for charity. As per the RiverKings website, the auction "raised $8550.00 with a portion of the funds going to the Maddox Sports Advised Fund". A big thumbs-up for the money raised by the RiverKings as it will go to helping people in and around the state of Mississippi. Well done, RiverKings. If the gripe about the font not being the best choice was my biggest complaint, there really isn't a lot to get worked up about when it comes to these uniforms. While fans who won jerseys in the auction went home happy, the crowd went home a little down after the RiverKings fell 1-0 in a shootout to the IceGators after both goaltenders - Mississippi's David Wilson and Louisiana's Riley Gill - posted scoreless frames for four periods. Shawn McNeil's shootout goal stood as the winner in the game. What do you think, readers? I have yet to find an actual image of the game on any website, so I can't show any pictures of the Elvis jerseys in action aside from the one above. Thoughts? Likes? Dislikes? Let me know in the comments!